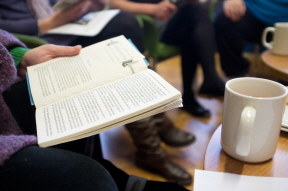 As a New Year approaches, we’re looking forward to even more shared reading across the UK as The Reader Organisation’s current work in the South West is expanding into the county of Wiltshire. Building upon our previous work in Devon, we are introducing new Library Memory Groups for people with memory loss and their carers across Wiltshire, in partnership with Wiltshire Council, starting in January 2014. We ate mince pies and read a short extract from A Child’s Christmas in Wales by Dylan Thomas (featured in A Little, Aloud) which had members talking about their memories of snow piles that buried their front doors! They had to shovel their way out. The snowy landscape made others remember the milkman and his horse bringing the milk which was frozen solid in the glass bottles. One member’s favourite line was “….and smoke, indeed, was pouring out of the dining room, and the gong was bombilating…” We all agreed that was such a good word – it really seems to describe the sound the gong would make! One lady had a gong although she’d never used it. Perhaps she would, she said, if her house was on fire like Mrs Prothero’s house. Then it was on to sharing two poems: Innocents Song by Charles Causeley and Minstrels by William Wordsworth. We talked a lot about the following lines “Why does he ferry my fireside / As a spider on a thread, / His fingers made of fuses / And his tongue of gingerbread?” It made one man think of all the pictures you see looking into an open fire. We talked about the way the poem started off seemingly innocent but how it soon became much darker. “How can you ferry a fireside?” one man asked. Someone said it seemed that someone was crossing in front of the fire, weaving his way like a spider.